Celebration time for Linfield's Andy Waterworth against Ballymena United. Pic by PressEye Ltd.
Andy Waterworth’s deadly double helped Linfield claim a place in the County Antrim Shield final on his landmark night. The big striker was making his 250th appearance for Linfield – and he celebrated the occasion in some style against Ballymena United at the Showgrounds. David Healy’s boys will now face Crusaders in the decider on February 5 thanks to a 2-1 success. Battling United did made the Blues sweat for their victory - especially after substitute Cathair Friel pulled a goal back with 13 minutes remaining. But the visitors stood firm and deservedly got the result that keeps them in the hunt for a clean sweep of domestic trophies. United boss David Jeffrey surprisingly reshuffled his pack, making six changes to the team that defeated Dundela in the Irish Cup on Saturday - preferring to leave Shane McGinty, Friel, Steven McCullough, Jim Ervin and Johnny McMurray on the bench, while he was deprived of the services of suspended striker Adam Lecky. Blues chief Healy reinstated Josh Robinson, Niall Quinn and Kirk Millar to his starting eleven. But it was the home fans who were off their seats on only seven minutes when Tony Kane’s cross from the right was met by Ryan Mayse, whose volley flashed into the hands of Roy Carroll. Even with so many changes to the side, United were asking all the early questions. They tried their luck again when James Knowles whipped in a great free-kick which was met by Ryan Harpur, whose weak header failed to trouble former international shot-stopper Carroll, after Conor Quigley had been hauled down by a clumsy challenge from Millar. Linfield weathered the early storm and began to dictate things in the middle of the park, with skipper Jamie Mulgrew pulling the strings. They were almost in front on 24 minutes when defender met a Quinn corner-kick, only to see his header scrambled off the line by the alert Kane. The Blues were not to be denied because they were in front five minutes later. Chris Casement’s exquisite pass sent Jordan Stewart racing down the right. When the little midfielder picked out Quinn at the back post, he cut the ball back to Stephen Fallon, whose scuffed shot was touched over the line by Waterworth. United tried to come back off the ropes after Stewart had clattered into Knowles. The midfielder dusted himself down to try his luck with an audacious 30-yard free kick that fizzed inches over the crossbar. Hard-working Fallon then tried his luck from distance without troubling Ross Glendinning before the industrious Mulgrew sent in a blistering drive from the edge of the box that was brilliantly charged down by the body of Johnny Addis. The Blues thought they had increased the lead on 52 minutes when Fallon finished off a cut-back from Stewart, but the little midfielder had strayed into an offside position which was spotted by Andrew Davey’s assistant on the line. Seconds later, Millar missed a great chance of increasing his team’s lead when he met a brilliant cross by Quinn at the back post but could only direct his header wide. Linfield did hit a crucial second goal on 59 minutes. Joel Cooper danced his way free on the left before picking out Stewart. His low shot was superbly saved by Glendinning, but Waterworth was perfectly placed to convert. United were back in it again with 13 minutes left. Substitute McMurray whipped in a great cross from the right that was met by Friel and his header crept past Carroll. 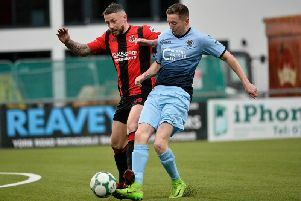 BALLYMENA UNITED: Glendinning, Kane, Quigley, Addis, Whiteside, Mayse (Friel 64), Knowles, Faulkner (McGinty 83), Shevlin (McMurray 64), Balmer, Harpur. LINFIELD: Carroll, Robinson, Callacher, Waterworth, Cooper (Clarke 86), Stewart (Mitchell 86), Millar, Fallon, Mulgrew, Quinn, Casement. Unused subs: Deane, O’Connor, Kearns.